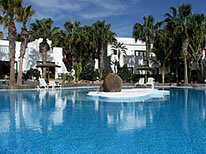 Costa Calma (Sotavento) is a quiet coastal town/resort located about 80 kms south of the airport in Fuerteventura. The South is quieter than the north with less tourism thanks to restricted development. The pristine white sandy beaches and dunes on the Jandia peninsular rival some of the worlds finest. 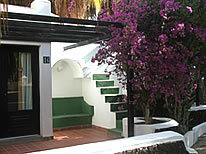 All guests stay in our budget apartments or more spacious bungalows in the resort of Costa Calma. Our Experienced Kitesurfer Holidays in this area offer great value for money and are ideal for couples or friends who want to kitesurf one of Europes legendary spots and enjoy the beach and the laid back Canarian pace of life. Sotavento located on the outskirts of Costa Calma is considered as one of Europes best and most consistent kitesurfing spots and in summer it hosts the annual Professional Kitesurfing World Cup. The warm climate, consistent wind and variety of conditions make it a great all year round kitesurf destination. The trade winds blow from as early as March through to Sept, summer is the prime season however thanks in part to the spot being located in a wind acceleration zone there is sufficient wind to kitesurf all year round. The Pro Kitesurf centre is located right on the beach/spot and offers a wide range of services and facilities and stocks approx 350 kites, 120 boards from the Cabrinha brand. NB: From 1st October to 1st March we also offer a 4 out of 7 day reduced rental package. We also Please ask the ZOCO Team for more details. Please note: all prices are per person and places are subject to availability at time of booking. We accept payment in Euros (€ EUR). NOTE: Flights and Airport Transfers are not included in price, check out our Getting There guide for low cost flights to Fuerteventura Airport. These compact and bijou one bedroom apartments are located on a small quiet development in the heart of Costa Calma and are only a stones throw away from the beach, main shops, tapas bars and restaurants. 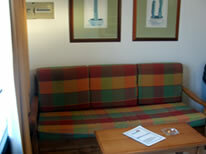 They are ideal for two friends or a couple looking for comfortable, affordable holiday accommodation. 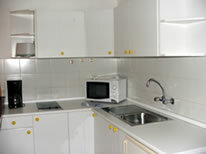 Each apartment has a twin bedroom, shower room and open plan living area and kitchenette. All of the apartments have a small balcony or terrace which has a patio table and chairs. 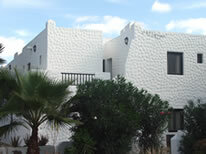 FACILITIES: Terrace/Balcony, Patio Furniture, Tea & Coffee Making Facilities, Hob, Microwave, Fridge, Safe, Satellite TV. These spacious one bedroom apartments or bungalows are located on a quiet 3 star tourist development in the heart of Costa Calma and are only a stones throw away from the beach, main shops, tapas bars and restaurants. These apartments and bungalows comprise of a large open plan lounge and kitchen area and a full family bathroom. The sofa converts into a bed which is suitable for a child. 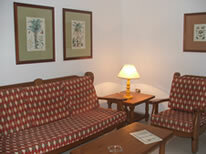 The apartments and bungalows all have a twin bedroom with built-in wardrobes. 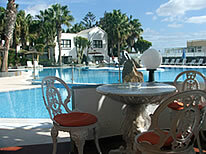 Both have large sunbathing terraces which have sunloungers and patio furniture. FACILITIES: Terrace/Balcony, Patio Furniture, Tea & Coffee Making Facilities, Hob, Microwave, Fridge-Freezer, Safe, Satellite TV. The development has two beautiful swimming pools, both of which are surrounded by sunbathing terraces, parasols and sunbeds. The main pool is acclimatized to around 23 degrees. 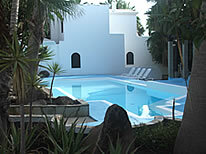 There is also a small children´s pool which is only 50cm in depth. There is a Pool Bar offering snacks and refreshments plus an onsite Reception with internet access. The Kitesurf Centre was opened around 10 years ago and since then Sotavento has earned a reputation as being the perfect spot for kitesurfers and every year hosts the annual Kitesurf World Cup. The wind is predominantly cross-offshore and the kiteboarding spot forms part of a long stretch of fine white sandy beach. Sotavento lies directly in a wind accelaration zone and as such it’s the islands most consistently windy place. The beachfront centre located on the edge of the lagoon lagoon has a good range of facilities including, air pressure system to inflate kites, freshwater showers, snack bar, wifi and WC etc. In addition the kite centre offers a wide range of kitesurfing equipment to rent by the leading kitesurf brand Cabrinha that will suit the needs of most kitesurfers. There are 7 types of boards in 22 different sizes plus a range of 4 kites in 25 sizes available. Equipment can be changed to suit your ability and the local wind and riding conditions (subject to availability). For your peace of mind there is a surveillence and rescue service operated by the centre during normal hours.